This select ensemble represents the finest wind and percussion players on the TAMU campus. The literature performed ranges from chamber works of the 16th century to the most recent original compositions for large band. Here is our repertoire. 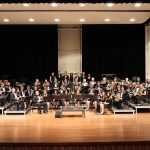 The wind symphony has performed at the Texas Music Educators Association (five times), the Western International Band Clinic in Seattle, the American Bandmasters Association (two times and convention host once), the College Band Directors National Association Convention (twice), and at the 2010 Midwest Clinic in Chicago. 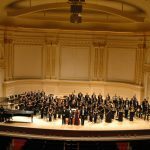 In 2008, the wind symphony performed in New York City’s Carnegie Hall. 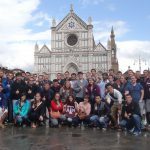 Since 1999, four European concert tours with the wind symphony have resulted in performances in Italy, Germany, Ireland, Austria, The Czech Republic, and England. The band records regularly each academic year and its series of compact discs recordings are with Mark Recordings of New York. Dr. Timothy Rhea, Director of Bands, has served as conductor of the wind symphony since 1995. Membership in the Texas A&M University Wind Symphony is based on a live audition performed for the conductor of the ensemble. Auditions are by appointment and take place in the E.V. Adams Band Building. Audition material is selected by the student auditioning and should include two contrasting excerpts which exhibit both technical facility and lyrical qualities. Students should prepare approximately two minutes of each style. Percussionists should select three excerpts, one each on timpani, snare, and keyboards. Sight-reading is also included in the audition process. To schedule an audition contact Mr. Almany at 979-845-3529 or talmany@tamu.edu or Dr. Rhea at 979-845-3529 or trhea@tamu.edu . Auditions should take place in the late spring or early summer prior to the student’s New Student Conference.